Brick and mortar retail is not dead nor dying. There are some things we love about brick and mortar retail outlets which online retail cannot compensate for. Using our senses to make decisions and being able to touch, smell, see and experience products cannot be replicated online. However, the brick and mortar retail experience could be augmented with technology that we like about online retail too. When you go to a store for something and the item on the shelf is out of stock, it can be disappointing. This can be a thing of the past with IoT shelf monitoring and restocking. The Levi’s-Intel collaboration is an example. By 2016, Levi’s installed Intel’s RFID sensors in stores to track clothing inventory through IoT based applications. Another way to go about this is automating via self-stocking or inventory robots like Amazon is doing through its Kiva Robots which constantly keep a tab of how much stock remains on a shelf and automates re-ordering before stock runs out and ruins the customer experience. Clicking on an item and getting recommendations for similar or complementary products. This is quite common on e-commerce websites on the same page as your selected products offering alternatives and suggestions. Whereas, in Brick and Mortar stores, you are dependent on either store assistants or your own willingness to scout aisles in the hope of finding an option in the similar range. The ease of being recommended options and suggestions realtime would be a great addition to brick and mortar retail locations. This can become a reality through interactive displays that can recognize the selected product, rigger options and display other alternatives or products that complement the one the customer is holding. For instance, In Italy’s Co-op Supermarket of the Future, customers pick up a product, a motion sensor recognises it and shows all the product information on an interactive screen. Connected technologies such as this can be used to personalize the shopper experience and recommend products within stores just as they would on an e-commerce website. When it comes to apparel, as much as you visualize, you cannot really ‘try’ clothes on E-commerce sites. Whereas in physical stores, sometimes the queue destroys your willingness to even enter the trial room. Smart Trial rooms are almost elevating that dilemma. 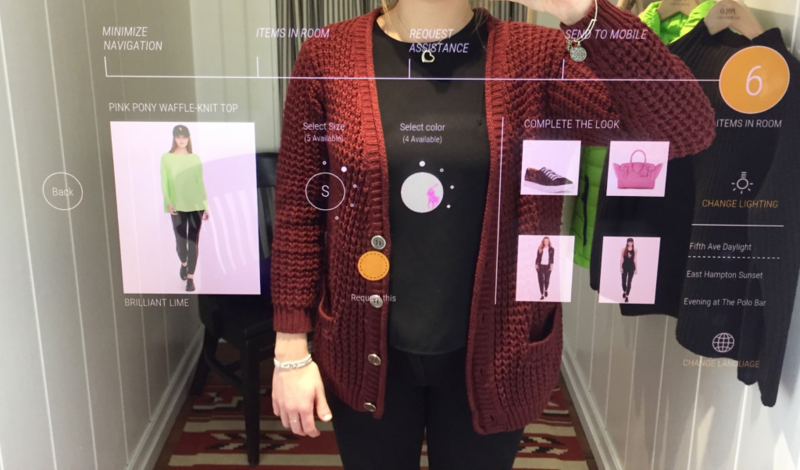 Brands like GAP and Ralph Lauren have introduced interactive trial rooms which help customers with item selection and recommendations, apart from helping them trying on clothes without going back to the shopping floor. Online checkout and digital payment procedures are so evolved today, they rarely go beyond a minute or two. However, when it comes to brick and mortar store, the endless lines can kill the experience. This is also changing with self-checkout technology. Amazon Go store is a great example where self-checkout has been implemented enabling smart products, sensors and RFID tags. Another is the Rebecca Minkoff and Queuehop Collaboration. By bringing QueueHop’s self-checkout technology to their retail stores, the brand is giving a digital experience to customers by allowing them to be in control of their physical shopping experience. Online Stores always prompt an action, “ready to make payment”, “apply a coupon”, “ready to checkout“. One can’t help but feel brick and mortar experience could use some of that. Add to that a lack of in-store staff or consumer information in general. While interactive screens like the one at Co-op Supermarket are capable of displaying all information related to CPGs such as nutrition, certifications, sustainability information like zero waste, organically manufactured, etc, other consumer products can find this application of smart products quite useful in brick and mortar stores. 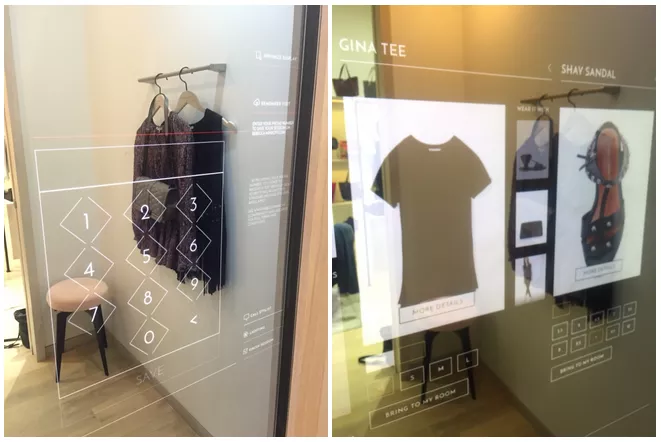 For instance, the interactive mirror in the Rebecca Minkoff store fitting room offers customers a prompt to enter their phone number to save the customer profile and gives recommendations based on the current and past fittings as they shop making the experience more engaging. IoT based technology can gather store-data on the cloud in order to provide the same level of analytics available in an e-commerce environment to executives and employees. Understanding behaviour of customers, movement of smart products through a store, purchase trends combined with analysis of this data can come in handy to reduce costs and improve store efficiency and shopper experience. We are slowly undergoing a retail shift which combines the best of e-commerce and brick and mortar stores. These shifts are being catalyzed by connected technology that allows brands to combine the best of both online and offline retail. Such product information-driven commerce when augmented with technology, has great potential to further blur the lines between the physical and digital.